Don’t worry, I’m not about to go into some elaborate step-by-step DIY project. You don’t have to be a DIY maven to find ways to add personal touches to your wedding day. And I don’t care if you have a wedding planner or are doing everything yourself, you need to think about this stuff. Here are a couple tips on how to let your personality shine on your big day. 1. Add Stuff You Like. I always get complimented on the décor at my house, which is funny to me because it’s literally just full of stuff I like (plus a lot of Matt’s college sh**). There’s no organized look, but what makes it work is the mix of complementary colors, a variety of textures, and things that mean something to us. Keep this in mind when it comes to your wedding. If you feel confined by a theme or set of colors, you’ll miss out on the opportunity to let your personality shine. So what do you like? Photos, flowers, antique vases, art prints, typography, books, Americana, stripes, wine corks? Figure out what you like and then find a way to incorporate that stuff. Cluster picture frames together (hint: it’s better if they don’t match), grab memorable items from your house to have on display, or make a collage of things you’ve done together as a couple (saved concert tickets, postcards, photo booth strips…you get the idea). At our wedding, the “stuff we like” includes: wine bottles we’ve saved over the years that have been cut into flower vases; engagement photos; large “M” and “G” letters, some wine boxes including one we got the day of our engagement; and we’re having people sign wine corks we’ve collected over the years instead of a guest book. Decorating for a wedding can get expensive. Why not use things you already have and love? As I mentioned above, our centerpieces are cut wine bottles, labels still on and everything. These bottles have fond memories for us of late nights on the patio sharing wine with friends and family. What perfect centerpieces, right? I also repurposed a few picture frames from around the house, plus a bulletin board and some flower vases. And I’m using a wine box given to me years ago by my dad as a card box. If you’re worried about things being a little too mix-and-match or eclectic, get yourself some good spray paint and paint items to match your colors. Seriously, spray painting is something you absolutely cannot mess up. Shake, spray, let dry, spray again. Grab stuff from your house (see “stuff you like”) and use it as décor at your guest book table, food table or even as part of your centerpieces. Ideas include: stacks of your favorite books, childhood toys or mementos, travel trinkets, candles and candle pillars, hurricanes, lamps, figurines, pottery – the sky’s the limit! Your loved ones play a big role in who you are, so why not incorporate them into your décor? For instance, my mom makes handmade soap, so she’s making soap with customized labels in our wedding colors (normally I’m vehemently against wedding favors but come on, who wouldn’t want a bar of handmade soap?!). If you have an artsy friend or family member, have them make signs, programs or create some artwork that match the wedding theme. My dad is pretty handy when it comes to building things, so he built some decorative flower planters that I intend to put flowers in (I’ve still got two weeks, people) to add some décor to the outdoor area of our wedding. My point is: you don’t have to come up with this stuff all on your own. Play to the strengths of those around you and add décor that means something to you. We’ve all seen a million Pottery Barn-inspired weddings. Make this unique to you! If you’ve ever watched TLC’s “What Not to Wear” you totally know what I’m referring to. Just like with your wardrobe, your wedding décor needs to have some visual interest and variety. It’s easy to get caught up in being matchy matchy, but don’t go so overboard on your color scheme that your wedding ends up looking like prom circa 1999. My recommendation is to pick one main color, one accent color and a neutral (ivory, gray, taupe, silver, gold, etc.) Then add visual interest by mixing in texture, pattern and shine. You don’t have to have all of these things going on at once, but make sure you incorporate at least one or two. Don’t be afraid to mix stripes and dots, floral and burlap, or sparkly with matte. Also, keep in mind that shades of the same color add a lot of visual interest. Our wedding color scheme is navy (main), shades of green (accent) and ivory/gold (neutral). You’ll find navy in the picture frames, soap labels, signs, bridesmaid dresses and the bouquet ribbons. 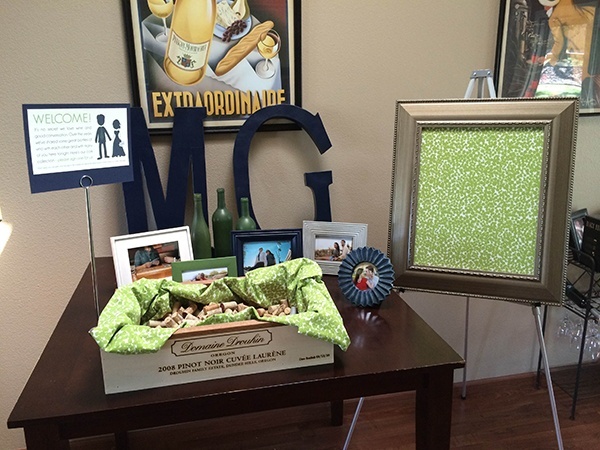 You’ll see shades of green in the flower arrangements, vases, the fabric lining the wine boxes and bulletin board, and in the groom’s tie. The neutral colors come into play in everything so that you don’t walk in and just see a sea of color. We have both floral and striped fabrics, a slight gold shimmer to the votives, and picture frames with a variety of textures. If you’re still confused, head to TLC.com and view some back episodes of “What Not to Wear.” Your wedding and your wardrobe will thank you! These are just some general parameters meant to help you in your path to creating a unique, personalized wedding environment. Don’t feel like you have to buy a bunch of matching, cookie-cutter wedding decorations. Instead, think about what you love, what personifies you, what you already have and who you know. Your wedding will be beautiful because it represents you!